Defending Hockey East champion BU was ranked #2 in the annual poll of the Conference’s writers & broadcasters Association. The Terriers received seven first-place votes, while BC secured the top spot with 20 first place votes. Lowell, Providence and Notre Dame were third, fourth and fifth respectively, followed by Vermont, Northeastern, New Hampshire, Connecticut, Merrimack Maine and Massachusetts. The poll, in which The Terrier Hockey Fan Blog participated, also picked a pre-season All-Hockey East Team. BU captain and All-American Matt Grzelcyk and senior forward Dan O’Regan earned spots on that squad. ►Hockey East Media Day is set for today, Sept. 21. Check back later for the results of the Coach’s Poll and links to interviews with David Quinn and the other teams’ head coaches. The All American Prospect Game, set for Thursday, Sept. 24, will be broadcast live on the NHL Network. Puck drop at First Niagara Center in Buffalo is at 7 p.m. Current freshman Charlie McAvoy and 2016 recruits Kieffer Bellows, Clayton Keller and Chad Krys (photo) will participate in the game. 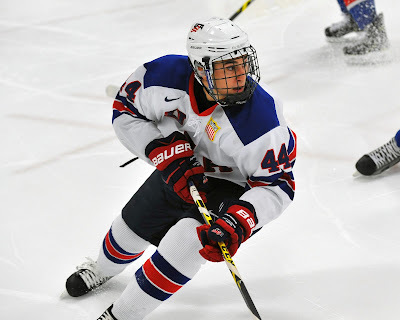 Three games into the NTDP U18s season, Keller (#19 in video below) is tied for the team scoring lead with four points, while Bellows (#22) has three and Krys has one. College Hockey Inc. posted a list of former NCAA players currently in NHL training camps, including 19 Terriers. 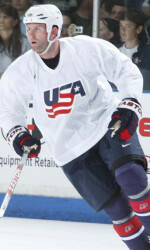 Former BU standout defenseman Ryan Whitney announced his retirement on Sunday. Earlier this month he had joined Modo of the Swedish Professional League, however injuries suffered initially while at BU and aggravated during his 481-game NHL career forced him to call it quits. A 2002 Penguins first-round draft pick (fifth pick overall), he also played for Anaheim, Edmonton and Florida before spending last season in the KHL. In three seasons at BU, he scored 59 points. The Scituate native, who also played for the Silver Medal US Olympic Team in 2010, used twitter to share his thoughts on his career and the decision to retire. So, what's next for Whitney? Don't be surprised if he makes a move to the broadcast side of hockey as an analyst. He's got the knowledge and the personality for the job. Check out his ESPN interview with John Buccigross this past April 23.